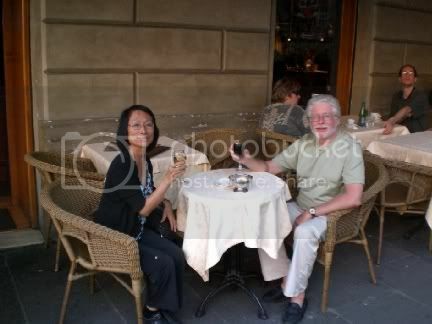 Just a quick interlude before I post about my last day in Rome. You may remember that I had posted about the "Waterfalls" installation that was getting rave reviews. You may also remember that I was less than impressed saying that it pretty much just looked like scaffolding with water pouring off the top. I also said that the $16 million price tag struck me as being nothing short of ludicrous. Well, it has become even more so. 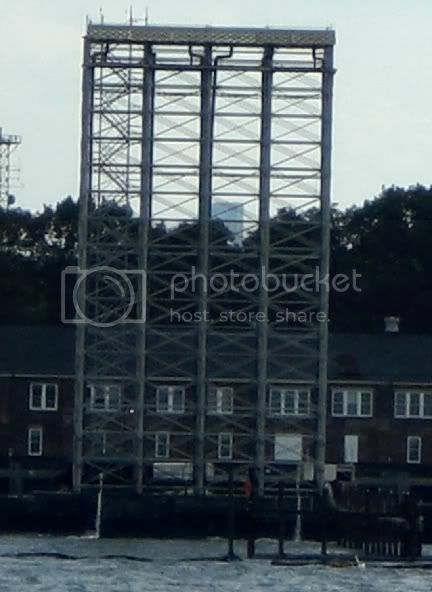 Yesterday the Mysterious Chinese Woman and I headed over to Staten Island for a baseball game (more on that in another post). It was a lovely Friday afternoon, just perfect for a ride on the Staten Island Ferry. This is a great free ride with beautiful views of downtown Manhattan, the Statue of Liberty, and Governor's Island where one of the "Waterfalls" is installed. Well, guess what, the water is no longer running. Whether this is temporary due to a problem of some sort I really cannot say. Hey, for only $4 million per "Waterfall" what do you expect? Interestingly, or not, although there was all kinds of hoopla when the water was turned on, I haven't seen anything about why this one is no longer running. I will go check out the other "Waterfalls" today to see if they are still operating. Gosh, I certainly hope the tourists coming to see these "Waterfalls" who were supposed to pump another $55 million into the local economy aren't too disappointed. Addendum - Today all "Waterfalls" are operating, pictures to follow shortly. We decided to steer clear of the touristy areas for dinner and try to find something more along the lines of typical neighborhood fare. The shuttle from the Hotel also drops you off by the railroad station, although I don't think it is the one we came into. This one does have a train that goes to the airport though. It is pretty small. No matter, we weren't going to be taking any trains. It was also near to a subway stop and along a trolley lines. The neighborhood is a bit on the run down side with a lot of, not sure what to call them, places that cater to the commercial trade and things like that. Garages, whatever. There were a couple of bars that had gambling and billed themselves as casinos. I should have peeped in one but for some reason I didn't. Well, the some reason was the Equally Mysterious Sister who doesn't really feel comfortable in places like those. She didn't say anything, but I know her well. 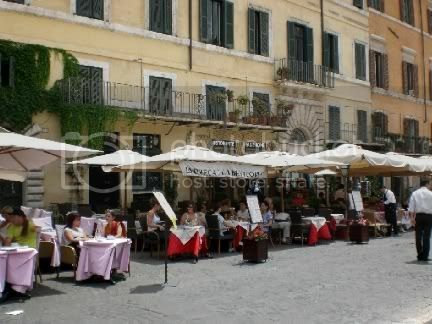 There is a main drag, Viali di Trastevere. It runs a couple of blocks away from and parallel to the river, Fume Tevere. It then dead ends at the rivers edge where the river makes a bend. 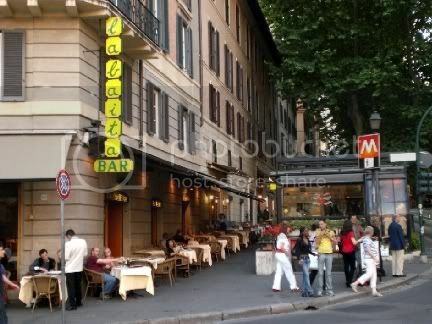 As you walk further along the street away from the train station the neighborhood becomes more residential with retail stores and little restaurants, many with outside seating. We pretty much picked the first one we came to that looked nice, and we weren't disappointed. 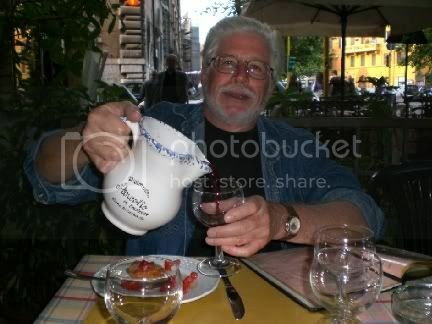 Having worked up a bit of a thirst I decided to order a carafe of their house red. 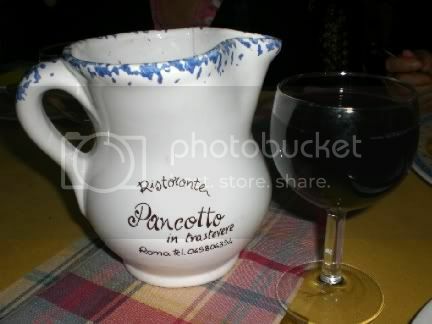 A nice little wine that they served in a stoneware pitcher. I had a pork dish really good in a rustic way. 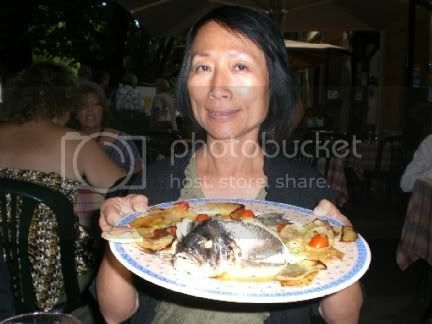 The Mysterious Chinese Woman opted for a whole fish and she wasn't disappointed. Somewhere along the way we also had gnocchi. I am not sure if it came with something or we ordered as a side dish. All I can say is that it was delicious. The best, by far, that I have ever eaten. It was fluffy yet chewy and not at all doughy like they so often are. The service was really good and very friendly. We chatted a bit with the owner and he was a riot. We really enjoyed ourselves and if we had the time we all agreed that we would come back again. 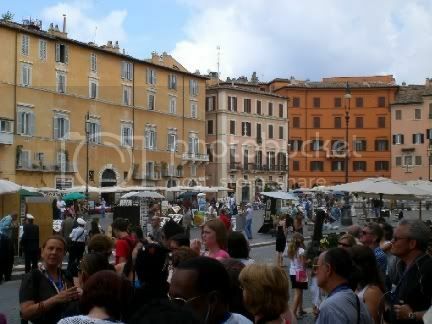 It wasn't too crowded when we arrived, but then we were early for Italy. By the time we were finishing up it had pretty much filled up though. 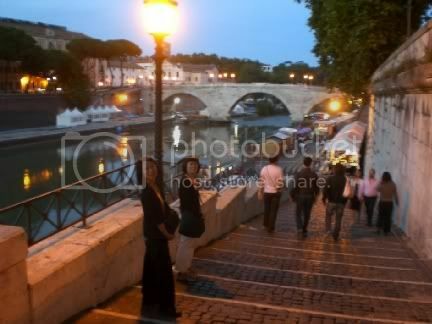 We decided to walk along Viali di Trastevere to the river and then walk along the river for a ways on our way back to the shuttle. It turns out that this stretch by the river is the scene to a lot of night life. Again, by Italian standard this was still very early so there weren't a whole lot of people here yet. 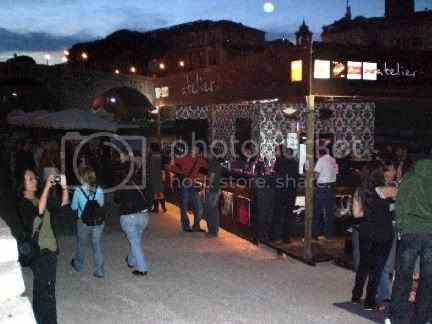 But the walkway was lined with little bar areas and stages for bands. I bet along about midnight this place really rocks. 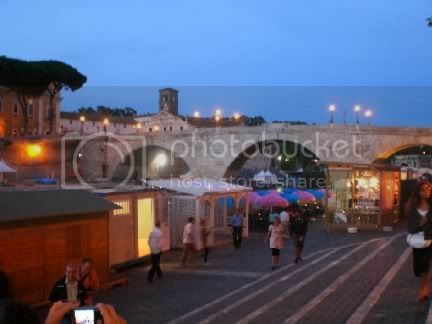 My opinion about Rome is starting to change a little bit now that I am discovering more and more interesting thing. 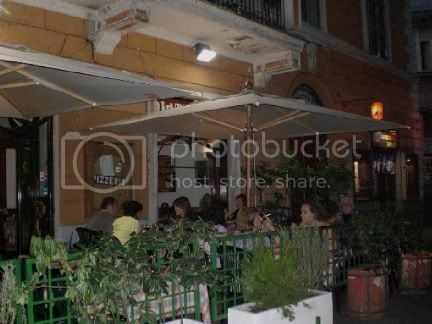 In fact on our walk back to the shuttle we passed a real neat looking restaurant with an outdoor garden area. 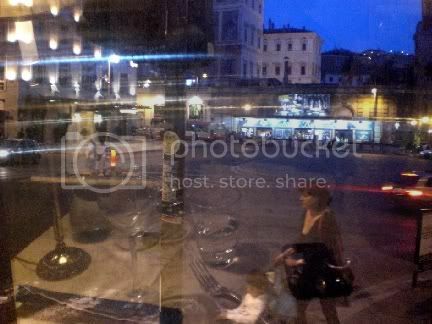 We all agreed that is where we should have our last dinner in Rome the next night. Okay, nobody correctly identified the building with the hole in the roof. Or at least nobody posted or emailed me a correct answer. 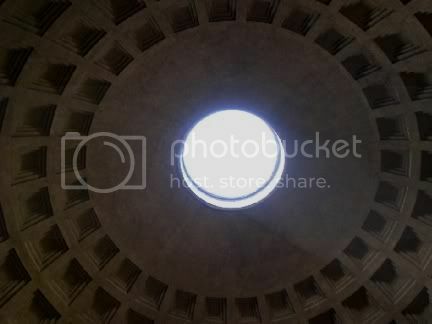 Pantheon is made up of two Greek words, pan which means everything and teon which means divine. It, supposedly, was built as a temple to all Roman gods. A bit of history. It was originally built in about 26 BC by Agrippa who was the admiral of the fleet that defeated the fleets of Mark and Cleo in the Battle of Actium. This victory consolidated Rome under Octavian who went on to become Caesar Augustus and the owner of Caesar's Palace in Las Vegas. Agrippa was Octavian's son-in-law so I guess he got to build things whenever he wanted to. 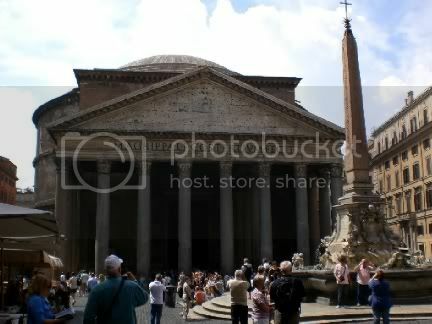 Sadly, the Pantheon burnt down in a huge fire in 80 AD and was totally rebuilt during Emperor Hadrian's reign. In 609 AD the Emperor Phocas gave the building to Pope Boniface IV who converted it into a Christian church. This, probably, is what saved the building when so many other ancient ruins were pretty much destroyed to provide building materials for more modern structures. It was never abandoned and was always actively used as a church. It is a very nice building and was probably my favorite touristy spot. One reason was that it was fairly small so you could take it all in rather quickly. The other was that it is nice and cool inside. That is because of the way it was designed, really an impressive architectural feat. 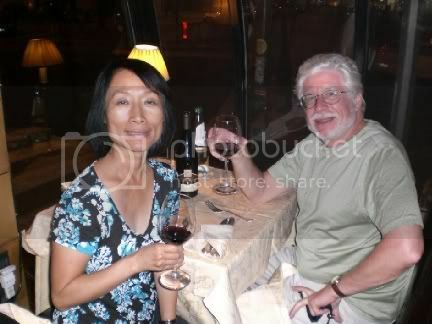 Later that evening the Mysterious Chinese Woman and I took advantage of the free hotel shuttle that drops you off by The Vatican and a nearby subway. 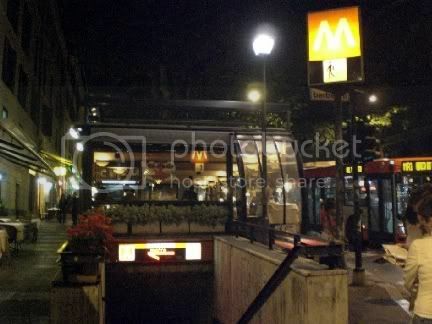 We took the subway to a stop we had seen from our tour bus earlier in the day, an area that looked interesting with a lot of cute restaurants. 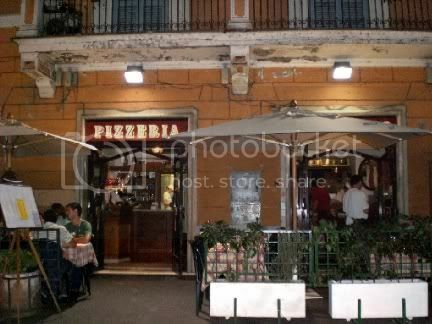 Note to self, a lot of clustered cute restaurants in Rome tends to mean touristy. Right by the subway stop was a pleasant looking outdoor cafe where we decided to have a glass of wine before scouting out the neighborhood. The wine was decent and the waiter friendly. He graciously took our picture and then pretended to pocket our camera. Hah Hah, what a card, laughed so hard I snorted. About as funny as the guy in last night's restaurant who pretended to drop your camera while holding on to the strap. There must be a school for funny camera tricks that these guys go to. We walked around the neighborhood a bit and finally decided that the restaurant right across from where we had our wine looked good. It was all glass enclosed and was affiliated with la baita. The food was prepared in the building across the sidewalk from it and then carried over. I wish I could say that the food was good, but, sadly, that wasn't the case. 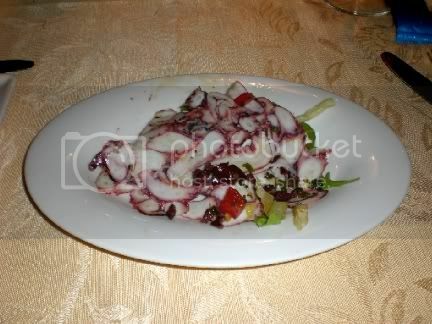 I started out with an octopus salad and really had a salad with small whole octopus in mind. What I got instead was some kind of an octopus headcheese. Not really very appetizing. One of the things that made me choose this place, other than the location, was that I saw someone eating what looked to be a nice steak. That was what I ordered and it was one of the toughest I have ever been served in a restaurant. On the other hand, the pistachio gelato that I had for dessert was very good and the portion was large. The waitress was very nice though and gently recommended a different wine then the one I had originally selected. Apparently my choice was kind of a lightly carbonated dessert wine. I bet it would have tasted like Ripple, still one of my all time favorites. Despite the disappointing food it was a pleasant enough place to sit and spend part of an evening just watching the passing scene. And it was certainly easy enough to catch a subway back to our hotel shuttle. All and all it was a very nice evening and our meal probably cost less per person than what the Equally Mysterious Sister paid for a bowl of soup back at the hotel. The next day we finally started to move off the beaten track a bit, as you shall see. Not only is Bar Man not a very good tourist, he is even worse when it comes to writing about touristy things. 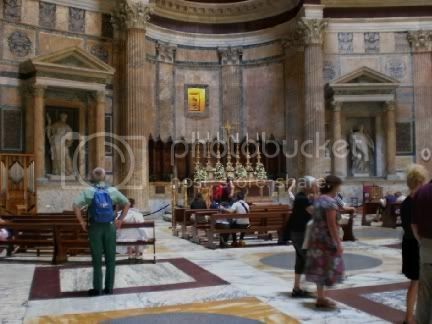 I do have some pictures of the touristy places where we went, like the Sistine Chapel. Well, actually, not the inside of the Sistine Chapel itself, but the building that surrounds it. But what can I write about it that hasn't been written before. Oh, except that you can no longer take pictures inside the Chapel itself because of a deal that was made with a Japanese company. In exchange for funding the cleaning and restoration of the Sistine Chapel they got the rights to sell all of the souvenirs, postcards, calendars, reproductions of statues, body parts of deceased saints, the usual. They then mandated a no picture taking policy in the Sistine Chapel itself so that it would increase the sale of said souvenirs. Hey, you want a picture, buy it. Anyway, I am not good at taking pictures and writing about stuff in museums, even things that I found interesting at the time. I might stuff a couple of those into a future blog though. Into our second day my opinion of Rome was still one of historical sights and tourist attractions, some of which were built around something historical. Well, in Rome I guess just about everything is historical. They can't even build a subway because they keep digging up antiquities. Then they have to stop construction until a team of archaeologists spends a couple of years sifting through the rubble. One thing that there are a lot of are open squares, usually with a statue or something in the middle. Of course this is prime real estate because these things are to tourists as roach motels are to, well, roaches. Tourists are just drawn to them and once inside they get stuck. The bait is all of the little outdoor cafes that line the perimeter of the square where it seems to be compulsory to sit and have something to eat and drink and watch the passing crowd. 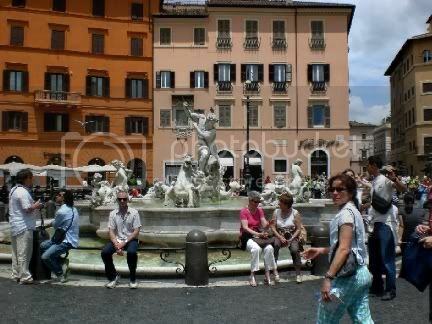 Of course that crowd is all tourists looking for a place to sit where they can watch the passing crowd. Bar Man isn't adverse to being part of the touristy action though. And after visiting the Sistine Chapel and some other place that has a big hole in the top and a bunch of little ones in the floor, I ended up here as well. 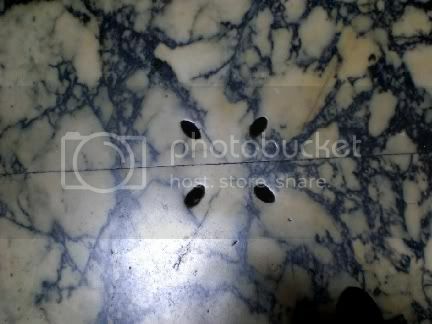 Okay, now this is a real famous place, the one with the holes, so if you know what it is or want to take a guess, post a comment. All will be revealed in the next post, but don't expect too many pictures. Anyway, after a morning of guided sight-seeing we were let loose. The Mysterious Chinese Woman and her Equally Mysterious Sister decided to go shopping so I followed my basic roach-like instincts. 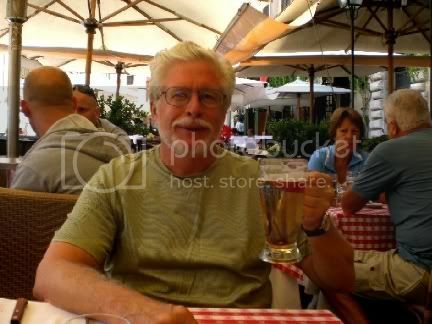 I managed to get a couple beers down before the women-folk showed up. We decided to get a bite to eat as long as we were here. Believe me, this wasn't my idea. I wanted to hunt for something a bit more authentic but was over-ruled. We ended up getting a couple of pizza's that were okay, at best. The Equally Mysterious Sister got a stomach ache later in the afternoon though, and she wasn't able to join us for dinner at, as it turned out, another touristy place. Hooray, my friend Mark, who I can recommend for all of your PC needs, did a yeoman's job recovering my lost pictures on my Lacie Big Drive. This was no small feat, as I was able to observe, and which he took pains to let me know. But, recover them he did. And, really, he didn't kvetch too much. I think he secretly enjoyed the challenge. 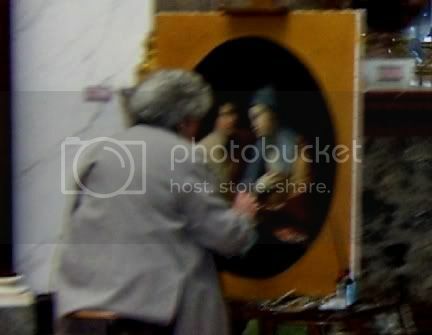 And, speaking of pictures, when I was visiting the Louvre there were a number of people who were making copies of the paintings on the walls. Obviously they must have special permission to do this. 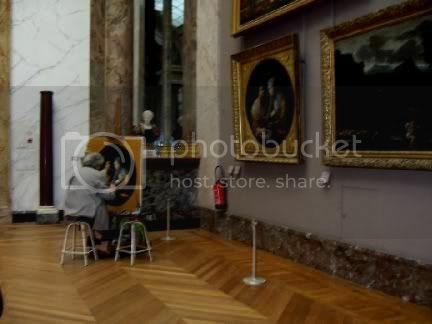 I doubt if they just let anyone wander into the Louvre with a bunch of paints and paint brushes. If they did I suspect there would be a lot of mustaches. One thing that I did notice, however, is that everyone making a copy seemed to just be putting on the finishing touches. And there were at least a dozen people I saw who were making copies. After awhile I began to think that maybe these people were just here to create some kind of an ambiance. I mean, wouldn't you think that someone would just be starting, or maybe just halfway done. How is it that everyone was just finishing up? Another one of those mysteries of life. Anyway, tomorrow I will be able to continue posting about my visit to Rome, so be sure to come back for that.